St Patrick’s College, Jaffna was established as Jaffna Catholic English School in 1850. Below are brief biographies of the Bishops who were involved in its founding and early development. Bishop Orazio (Horace) Bettachini C.O. Orazio (Horace) Bettachini was born in Piosina near Città di Castello in Italy in 1810. He studied at the major seminary of Città di Castello and was ordained in 1840 by Archbishop Giovanni Alessandro Muzi. After his ordination, he served as Parish Priest of San Martino d’Upò for 2 years. He then joined the Oratory of Saint Philip Neri (a Congregation founded by St. Philip Neri in 1575) and in 1842, was sent as missionery to Ceylon to assess the state of the Church there, a church that had until that time been entrusted to the Oratorians of Goa. Father Bettachini was appointed as titular bishop of Toron and coadjutor of the Vicar Apostolic of Ceylon, with particular responsibility for Kandy on May 6, 1845 and consecrated as Bishop on February 8, 1846 by Bishop Gaetano Antonio Mulsuce, Bishop of Usula. On September 17, 1847, he was appointed pro-vicar apostolic for the northern sector of the island and on August 28, 1849 as Vicar Apostolic of Jaffna. In 1847, Bishop Bettachini had made a trip to Europe to raise funds and find missionaries. After meeting with the president of the Society of the Propagation of the Faith in Lyons, he left for Rome, passing through Marseilles at the beginning of April 1848. There, he asked Bishop de Mazenod – the founder of Oblates of Mary Immaculate – for missionaries and a band of 4 Oblates arrived in Jaffna on March 10, 1848. Thus started the association of St Patrick’s College (and the Diocese of Jaffna) with the OMI order. Bishop Bettachini to ok much interest in catholic education of the children in his mission and in 1850, he founded the Jaffna Catholic English School (which is now St. Patrick’s College). Bishop Bettachini retired due to ill-health in March 1857 to the Parish of Our Lady of Assumption, Bolawatta, (a parish founded by Oratorians, circa 1730). He died on July 26, 1857 and was laid to rest at the Church. (Note: the photographs of the Bishop and his burial site were kindly provided by Rev. Fr. Jayantha Perera, Parish Priest of Our Lady of Assumption, Bolawatta). Étienne Semeria was born in Cola, diocese of Ventimiglia, Italy, on February 7, 1813. Two of his uncles were priests and his aunt was a Capuchin Sister. At the age of 16, he had completed his classical studies and began his novitiate in Saint Just on May 1, 1829. He took his vows on May 1, 1830 and continued his studies in Marseilles from 1833 to 1835. He was ordained to the priesthood by Bishop de Mazenod at Notre-Dame du Laus on September 19, 1835 and was given responsibility for the ministry among the Italians in the church of Le Calvaire. In 1840 he was appointed as superior in Vico, Corsica. It was during the summer of 1847 that Bishop de Mazenod agreed to send some missionaries to Jaffna, Ceylon, at the request of Bishop Horace Bettachini, coadjutor of the Apostolic Vicar of Ceylon and sent Fr Semeria, Fr Louis Marie Keating from Ireland, Fr Joseph Alexandre Ciamin from Nice and Bro. Gaspard De Stefanis from Genoa to Jaffna. They arrived on March 10, 1848. On September 8, 1848 Fr. Semeria was officially appointed Secretary, (equivalent of Vicar General) of Bishop Bettachini and the pastor of the mission of Jaffna. There was an outbreak of cholera epidemic in August 1849 in Jaffna. There was hardly a family that was not affected by the disease. In September 1850, in the midst of their dedicated ministry, Fr. Semeria and his assistants, Fr. Le Bescou and Bro. De Steffanis also caught the infection, but Providence came to their rescue and spared their life. On June 6, 1856, Fr Semeria was appointed titular Bishop of Olympus and coadjutor of Jaffna and was consecrated as Bishop on August 17, 1856 by Bishop de Mazenod, in the chapel of the scholasticate in Montolivet, on the occasion of the General Chapter. Scarcely had he returned to Jaffna, when he became Apostolic Vicar of Jaffna due to the death of Bishop Bettachini, which had taken place on July 26, 1857. During his time as Vicar Apostolic of Jaffna, he opened many schools, renamed the Jaffna Catholic English School as Jaffna Boys Seminary and established the Jaffna Ecclesiastical Seminary for the purpose of forming catechists and priests. He brought the Holy Family Sisters of Bordeaux to manage the schools and to open dispensaries. In 1859, he opened the first catholic parish library in Jaffna. This library had two sections: one with English books and the other with Tamil books. In 1867, Bishop Semeria travelled to take part in the General Chapter of OMI. He intended to return to Jaffna on January 26, 1868, after having visited the families of his missionaries. He arrived at the church of the Calvaire on December 29 with a bad cold and was subsequently diagnosed to have catarrh and a high fever, as well as complications of the gallbladder. He died on January 23, 1868 at the age of 54. His funeral took place in the cathedral and was presided by Bishop Place of Marseilles. He is buried in the Oblate tomb in the cemetery of Aix-en-Provence. Christophe-Ernest Bonjean was born in Riom in the diocese of Clermont in France on September 21, 1823, the second of 3 children of Yvonne Tardif and Jean-Baptiste Bonjean, attorney-at-law of the court of appeal of Riom. Abbé Michel Deval – the parish priest of the parish of Pontaumur where Mr Bonjean worked as justice of the peace – encouraged Ernest to study for priesthood. His father, however, advised him that he would allow him to pursue his vocation after gaining his baccalaureate. Helped along by his older sister, Émilie, he studied hard and received his baccalaureate with honourable mention. He entered the major seminary of Clermont-Ferrand in October of 1842, and in January of 1846, entered the seminary of the Paris Foreign Missions. Ordained to the priesthood in Paris on December 19, 1846, he left in 1847 for the new apostolic vicariate of Coimbatore in India where he worked in various parishes and ministered to the Irish soldiers. He learned English and Tamil. After nine years of ministry, exhausted and suffering from being isolated, he desired to join a religious order. Abbé Pajean, a missionary confrere, spoke to him about the Oblates in the vicariate of Jaffna. In 1855, Abbé Bonjean wrote to Father Semeria (in Jaffna) who invited him to accompany him to France where he was going to attend the General Chapter of 1856. He arrived in Jaffna on November 28, 1855, after Father Semeria’s departure. While awaiting his return, he lived with the Oblates whose fraternal charity he esteemed. He began his novitiate under the direction of the vicar apostolic on May 19, 1857 and made his oblation at Trincomalee on May 20, 1858. In 1867, Father Bonjean was elected as the delegate of the Oblates of Ceylon to the General Chapter and accompanied Bishop Semeria to France. After the Chapter, Bishop Semeria fell ill at Le Calvaire in Marseilles and died on January 23, 1868. On the recommendation of Father Fabre, Superior General of OMI, Pope Pius IX appointed Father Bonjean titular Bishop of Medea and Vicar Apostolic of Jaffna on July 24, 1868. He was consecrated on August 24, 1868 by Archbishop Joseph Guibert, Archbishop of Tours. The new bishop immediately left for Jaffna where he arrived on October 25. Bishop Bonjean worked very hard to develop the works begun by his predecessor and began new projects in the area of education. In 1876, he founded a weekly publication, the Jaffna Catholic Guardian. 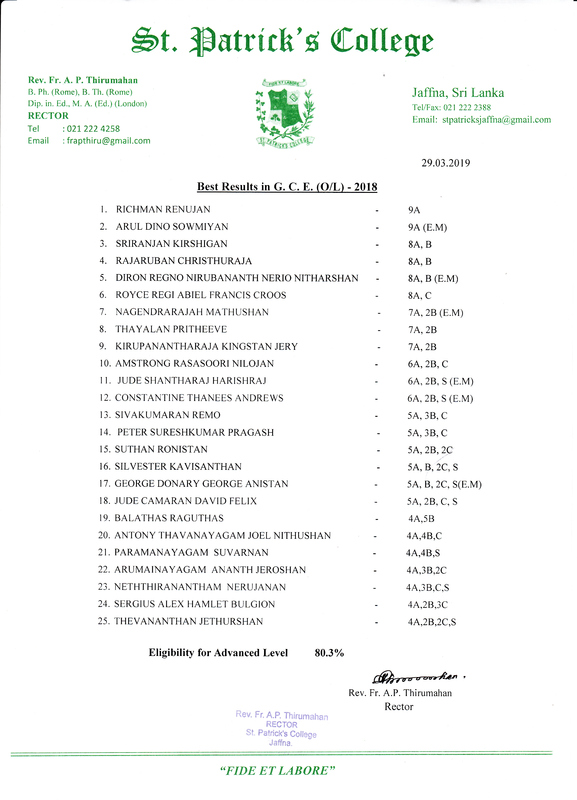 In 1881, he decided to amalgamate the Jaffna Boys Seminary with the Jaffna Ecclesiastical Seminary and renamed it St Patrick’s College and applied for the College to be registered as a complete high school. In 1883, the Holy See detached Kandy – which had been entrusted to the Sylvestrines – from Colombo and Bishop Bonjean was appointed Vicar Apostolic of Colombo. On June 6, 1887, Bishop Agliardi, the Apostolic Delegate in India, while passing through Colombo, announced that Jaffna and Kandy would become dioceses and Colombo an archdiocese with Bishop Bonjean as archbishop. At the end of 1891, Archbishop Bonjean was stricken with a grave flu and was confined to bed. He remained bedridden until his death on August 3, 1892 at the age of 68. His remains were laid to rest at St Lucia’s Cathedral, Kotahena, Colombo.